Have you ever caught a cold from a friend or work colleague? Did you see the germs go through the atmosphere and enter into your body and then do you harm, causing you dis-ease? Did you sense the dis-ease when it first started to manifest? I would imagine the answers to these questions would be no, as personally, I haven’t, but then again, even though my name may suggest it, I am not a superhero. This is exactly what WIFI is doing to all of us and we are not even aware of it. In my personal life, cancer cases are going off the charts, which is ringing alarm bells on all fronts for me, and is Electro Magnetic Radiation anything to do with this rise in cancer rates, which will soon reach 1 in 2 people? The World Health Organisation has just released a rather bleak report saying cancer will rise by 70 % in the next 20 years. Let’s take a look at some of the evidence that WIFI may be causing this. The BBC showed a Panorama documentary in May 2007 discussing the effects of WIFI and how it came to be in the UK. The programme concluded that WIFI is similar to radiation from mobile phones. Sir William Stewart was also interviewed who, at that time, was the Chairman of the Health Protection Agency. He stated ‘You can choose whether to have mobiles’. You have no choice with WIFI. He also said ‘There may be changes in cognitive function. There were some indications that there may be cancer inductions’. Sir William Stewart was asked by Tony Blair to look into the effects of radiation from mobile masts. He concluded that there were molecular biology changes with the cell. The report recommended masts should not be placed near schools. From this recommendation back in 2007 we now have WIFI antennas inside the classroom, which are mini masts. They give off three times more radiation than when standing in direct line of the mast. What an unbelievable turnaround of events, and a lack of Duty of Care to the general public. Tony Blair has more questions to answer over this money making scheme, along with his Iraq war debacle. The Health Protection Agencies stance today states “There is no consistent evidence of health effects from RF exposures below guideline levels and no reason why schools and others should not use WIFI equipment”. This is a very ambiguous statement to say the least!!! Dr Mike Repacholi, founder of ICNIRP, who also worked with the World Health Organisation stated there were no known health effects on the WHO website back in 2007. Prior to setting up ICNIRP, he worked for the phone industry defending their right to place masts in controversial locations. He was then re-employed by the phone industry after working for WHO and ICNIRP also. This is the man who set the guidelines for our exposure to this type of radiation. There seems to be a conflict of interest here, as does appear in many cases of big business controlling the political system for their own profit. And all this has been done in plain sight. ICNIRP, is an International group of scientists the government relies on to set radiation limits but their studies do not recognise any biological effects. It bases our exposure limits on a thermal effect. The radiation has to be so strong that it heats up your organs before it is restricted. That’s why our safety limits are so high. Switzerland, Italy, Russia and China all have exposure limits thousands of times below ours. In Saltsburg the government advised against WIFI altogether. A recent International Agency for Research on Cancer (IARC) report suggested that EMF exposures can be more devastating in children because their brain tissue is more conductive, their skulls are thinner, they have smaller brains with softer brain tissue allowing radiation to penetrate more effectively. And, a potentially longer period of exposure due to use beginning at an earlier age. This new French bill seems to have taken these concerns into account. Dr Ian Gibson, former Norwich North MP said in the BBC documentary ‘The British government were not adhering to the guidelines they commissioned. Industry ‘rules’ in this area and the precautionary principle and the safety of people who may benefit to some extent, from the technologies, are completely dismissed’. Sir William Stewart also wants a new investigation. He stated ‘There are people who are electro sensitive’s and feel the effects. They are the human canaries of the future’. So yet again we have another example of human guinea pigs. Do we really want our children to be the canaries in the coalmine? If the technology has not been tested for the pulse radiation that it emits, then how can this be deemed to be safe? Tony Blair and his Billion pound contracts with the telecommunication industries obviously wanted to ignore this fact. Professor Henry Lai, Dr Gerd Oberfeld, and Dr Olle Johansson all appeared on the Panorama documentary and spoke of the dangers of this type of radiation. I am not promoting the BBC in anyway, but here are the links to the documentary. Wireless communication devices are listed as a 2B carcinogen. The TUC document, Occupational Cancer: A Workplace Guide, advises that establishments do not introduce class 2B Carcinogens. Page 6 states that “Caution should be used to prevent exposure to substances in Group 2B”. The Management of Health and Safety at Work Regulations 1999, and COSHH (Control of Substances Hazardous to Health)  means that the first step must always be to remove the hazard altogether if possible. It seems to me that anyone who is reading this article from London Underground should be approaching their union representatives to get this technology removed from the tube system. 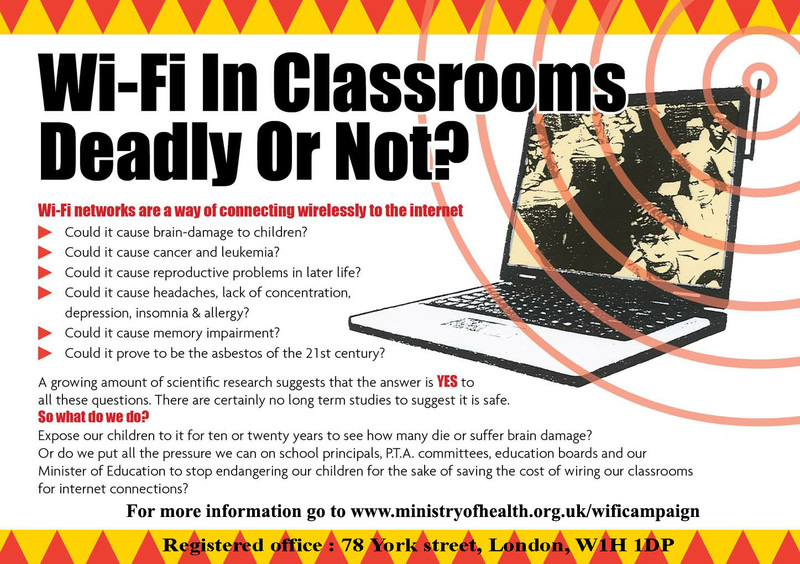 Wireless radiation that children are being exposed to in the classroom has caused so much concern amongst paediatricians in America, 60,000 of them have written to congress urging the removal of WIFI technology from schools. I have been in touch with Professor Olle Johansson who also says ‘There is growing scientific evidence that children are likely to be more vulnerable to pulsed microwave radiation than adults, and new research shows there may be other serious effects on behaviour and learning ability. There is general agreement among scientists that electromagnetic fields penetrate into the brain of children more than in adults because children’s skulls are thinner. There is also a broad consensus that children are more vulnerable to adverse effects from radiation because their bodies are still developing. The World Health Organisation, in 2011, classified electromagnetic fields from wireless information as possible carcinogens. The Council of Europe’s Environment Committee in its Resolution no. 1815 from May 2011 calls for strong measures to protect the public against harmful effects of radiation, including a ban on mobile phones and wireless internet in schools with regard to children’s health’. Here is the professor talking about the BioInitiative report with over 2,000 references to the harmful effects of this radiation. You can download this report from the Ministry of Health’s website from here. The BioInitiative 2012 Report has been prepared by 29 authors from ten countries, ten holding medical degrees (MDs), 21 PhDs, and three MsC, MA or MPHs. Among the authors are three former presidents of the Bioelectromagnetics Society, and five full members of BEMS. Also I have been in touch with Barrie Trower, who has written and published the 2013 WIFI report. This is entitled WIFI – A Thalidomide in the making. Who cares? That is what I ask myself every day. It seems to me that so many people are bamboozled by the ever increasing intensity of this meme we live in and are not looking at what is happening around them. This is a very frustrating place for the people who have woken up and are putting themselves out there to make a difference. Now is your chance to get involved and do something constructive. We also urge you to write to your local MP, MEP and councillors with the downloadable letter again from http://www.ministryofhealth.org.uk/wificampaign and send it through the website https://www.writetothem.com . Please collect all responses, both good and bad as we are going to collate all evidence and will be seeking criminal negligence charges from these people if they do not act. This is the wording of the UK’s statute. ”The failure to use reasonable care to avoid consequences that threaten or harm the safety of the public and that are the foreseeable outcome of acting in a particular manner” Once our civil servants have received this information, they are responsible for the harm done to our children and teachers through the use of this technology. What our children are subjected to is really intolerable for us as a species. After a baby has been conceived, it is bombarded by microwave radiation in the womb because of the soup we live in today. When the baby is born, the first kick start to the immune system is from the bacteria from the vaginal tract, which is now compromised because of the bad diet many mothers eat, like pre processed and fast food. Then up to the age of two, while still developing the immune system, the baby can be subjected to up to thirty vaccines, which can result in completely destroying the immune system. Then the use of bisphenol A in plastics, aspartame in sweets and other dangerous additives will also be attacking the immune system. Add GM food to the mix, together with the increase in aluminium, strontium and other such toxins in our air , leads to a complete health implosion of epic proportion. The baby does pick up on the electromagnetic frequency of the mother and fathers heart, where studies prove that a more emotionally balanced child will develop when held close to the heart area frequently, as opposed to ones that are not. This part of a child’s development is also being compromised by the pulse radiation, that doesn’t appear in nature, and will be disrupting the energy flow from parent to child. My final note would be to draw your attention to Manly P Hall’s speech on the magnetic field we have around us as human beings. This has again been looked into in recent times, even though it is ancient knowledge, and this pulse radiation from wireless technology does not occur in nature. Therefore we are currently having to deal with an ever growing soup of radiation, and we don’t understand the consequences of our actions. Human history is distorted, contrived and controlled to a certain extent, who knows what is the ultimate truth. All I am sensing is this is the wrong path we are taking with untested technology. It is about profit, not safety. Pink Floyd sung about ‘Welcome to the Machine’. In this case with the EMF soup we live in, it is ‘Welcome to the Coalmine’. You are the canary this technology is being tested upon!!! Here is an interview on the People’s voice featuring Professor Olle Johansson and Peter Parker talking to Richie Allen about the problems with WIFI, and what we can do about it. Here is the Ministry of Healths Get WIFI out of schools video. I think this needs serious evaluation. I am not refuting this or agreeing, BUT… Children and adults are both exposed to WIFI EVERY day, at home and in public, why does it make a difference in the classroom? Are you suggesting that NO ONE should ever be exposed? Seriously…..